Terrorism, like war, it is here to stay. Hence, the ‘war on terror’ is a war without hope by definition. You need only to think of all the species of ‘terrorism’ which have affected humanity since human history started. Terrorism, is like the influenza virus, it changes to remain the same. Today we face what has been called, or miscalled, Islamic terrorism. Tomorrow who knows? Terrorism cannot be, as anything else, understood only in tautological terms. It cannot be explained through itself. I even wonder whether the terminology ‘terrorism’ is not just a political semanticism to differentiate it from ‘war’, seen as a legitimate act of force and killing by states or nations. What do terrorism and war have in common? Horror. Therefore, following the insights provided by Talal Asad’s latest book On Suicide Bombing, should we not define both ‘war’ and ‘terrorism’ horrorism? Horror has the power to paralyse the intellect and undermine decision making since survival becomes the only useful action. Horrorism can only be rejected by holding to rational, a-emotional, structures. The best social political institution human beings have developed to resist and react to horrorism is liberal democracies. Yet horrorism tends to destabilise liberal democracies. Or you trust liberal democracy as not just a mere political system but a philosophical and cultural way of life, or you do not trust it; there are no in-betweens. Today, our UK government is attempting to hold our liberal democratic system in dangerous and unacceptable in-betweens. 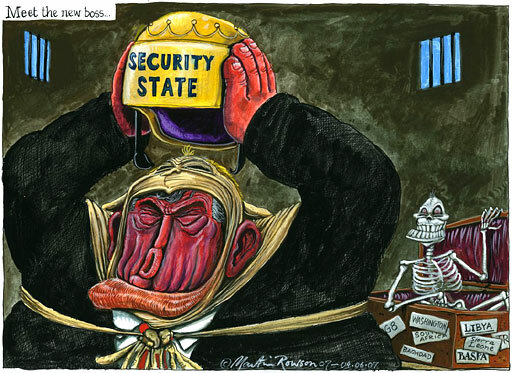 First of all, Dr Gordon Brown, who became Prime Minister in a similar manner that a prince becomes king, announced possible general elections for subsequently, after much speculation, protecting himself and his government from the test of the ballot-box. Secondly, the Prime Minister is trying to find support for extending the maximum time suspects can be detained without charge from the current 28 days (resulting from previous anti-terrorism hysteria) to 58 days. The government does not need to have the vote of the parliament to extend the detention to 58 days, since under emergency powers – normally only used in wartime – the government can extend detention for an extra 30 days. Yet the government does want the power to extend the detention without declaring emergency powers. Furthermore, other legislation is introduced that denies the very base of liberal democracy. For example, the government is seeking the power to seize passports from people who are suspected of trying to go abroad for “terrorism-related purposes”. In our history, Britain has suffered (and also perpetrated) many acts of ‘horrorism’, but never denied the liberal democratic values on which it builds itself. Today we are facing something that cannot even be compared (either numerically nor politically) to the challenge that the IRA represented to our freedom and security. Yet our government is ready to sell our liberal democratic values without any real, factual assessment of the risks involved. It is more an emotional drift. Or maybe are we, as Germany and Italy were in the 1920s, tired of the risks, challenges, differences and therefore uncertainties that any real liberal democracy brings with itself? Horror has the power to paralyse the intellect and undermine decision making since survival becomes the only useful action. I have only read the Introduction but it chimes with some of what the thoughts of this blog article. “In this groundbreaking book, bestselling author of No Logo exposes the gripping story of how America’s ‘free market’ policies have come to dominate the world through the exploitation of disaster-shocked people and countries. At the most chaotic juncture in Iraq’s civil war, a new law is unveiled that would alllow Shell and BP to claim the country’s vast oil reserves. Immediately following September 11, the Bush Administartion quietly out-sources the running of the ‘War on Terror’ to Haliburton and Blackwater. After a powerful tsunami devastates the coasts of Southeast Asia, the pristine beaches are auctioned off to tourist resorts. New Orleans’s residents, still scattered from Hurricane Katrina, discover that their public housing, hospitals and schools will never be reopened.